Bill is the most manic umbrella you’ve ever met. All high-energy all the time, Bill zips all over Sunnyland catching raindrops and shouting out whatever crazy exclamation is next to roll off his tongue. 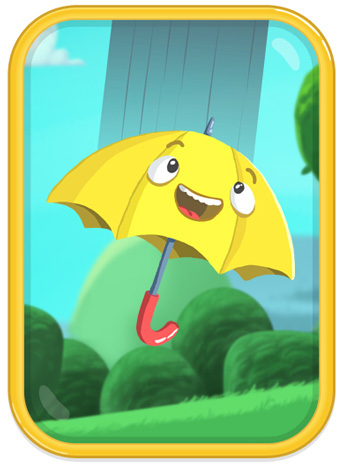 (Yes, Bill the umbrella has a tongue.) Bill is always trying to cheer Nimbus up with his off-color comments and off-the-wall antics. Though many find the hyperactive umbrella too much to take, Nimbus knows he means well. And Bill has a real soft spot for his cloud buddy. After all, what would an umbrella be without rain?